Sanderling: Medium-sized sandpiper with dark-spotted, rufous upperparts, breast and white underparts. Wings have conspicuous white stripes visible in flight. Bill, legs, and feet are black. Feeds on crustaceans, mollusks, isopods, worms, plants and insects. Swift direct flight with rapid wing beats. 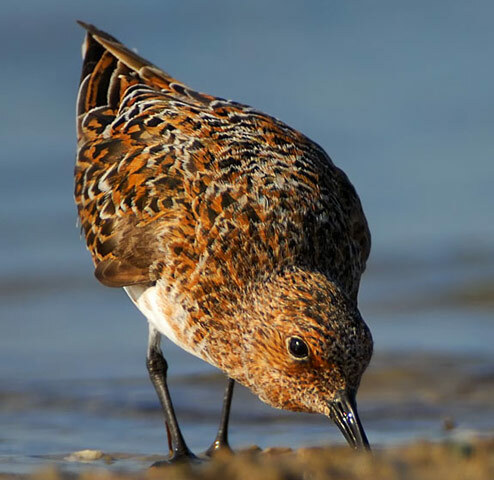 Sanderling: Breeds in high Arctic tundra from Alaska eastward to Baffin Island. Spends winters along coasts from British Columbia and Massachusetts southward to southern South America. Preferred habitats include ocean beaches, sandbars, mudflats, and lake and river shorelines. The Sanderling has a large range, estimated globally at 100,000 to 1,000,000 square kilometers. Native to Europe, Asia, Africa, and the Americas, this bird prefers grassland, wetland, or marine ecosystems. The global population of this bird is estimated at 620,000 to 700,000 individuals and does not show signs of decline that would necessitate inclusion on the IUCN Red List. For this reason, the current evaluation status of the Sanderling is Least Concern.